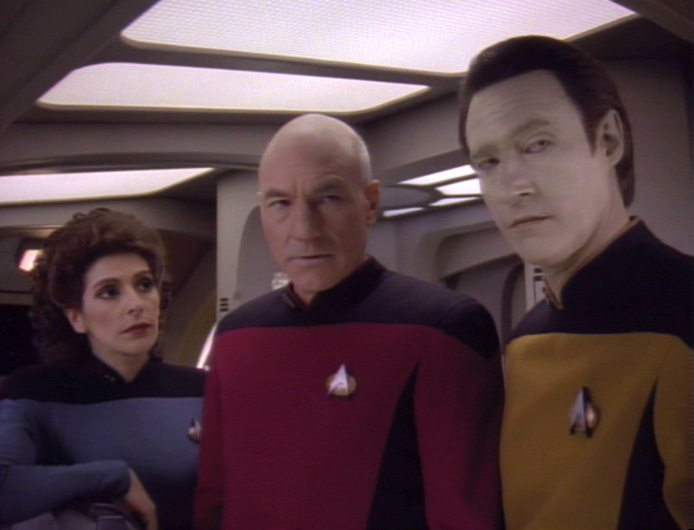 The Angriest: Star Trek: The Next Generation: "Timescape"
It is 14 June 1993, and time for another episode of Star Trek: The Next Generation. After returning from a three-day conference, Picard (Patrick Stewart), Data (Brent Spiner), La Forge (LeVar Burton) and Troi (Marina Sirtis) encounter a strange array of pockets in time that appear to slow down and even stop whatever is contained within them. They navigate their way to the Enterprise, only to discover the entire ship has been frozen in time while in battle with a similarly frozen Romulan warbird. Brannon Braga is Star Trek's king of time travel and temporal paradoxes. He wrote "Cause and Effect" for Season 5, "Parallels" and "All Good Things..." in Season 7, and of course both Generations and First Contact played with time travel of one kind or another. From there he moved to write or co-write a veritable truckload of time travel/paradox episodes for Star Trek: Voyager. All things considered, "Timescape" is one of Braga's earlier efforts, but it still manages to play a lot with the potential of time slowing down, stopping or even reversing entirely. The episode starts brilliantly, showing the four key characters relaxing and sharing light-hearted conversation with one another. It is nice to see them in such an informal capacity. Then time stops for the characters in various combinations, which turns out to be remarkably creepy. Not only does Troi see her crewmates frozen in time, we actually get to see it occur from the other side as time seems to jump forwards in the blink of an eye. As their runabout - a rare appearance for this Deep Space Nine starship in The Next Generation - leads towards the Enterprise, it runs into more of these dangerous time pockets. When they reach the Enterprise it is apparently locked in time in mid-battle with a Romulan warbird, which is an outstanding image and a great end-of-act cliffhanger. Once on the Enterprise, however, the episode gradually loses its appeal. This is an episode about a scientific idea and a mystery, which leaves it rather short on narrative and conflict. In some scenes it feels more like a forensic exercise than a drama. Once the mystery begins to be solved the episode becomes progressively less intriguing. That said, there is plenty to enjoy here on a moment-to-moment basis. Much of the humour works. A lot of the imagery is quite clever. Babylon 5 fans should keep an eye out for an uncredited Patricia Tallman as a Romulan officer. On a technical level this episode is very well directed by Adam Nimoy (son of Leonard), it is just a small pity he was not given a more exciting script. Patchy and flawed, "Timescape" does still manage to be a relatively entertaining exercise. We are 25 episodes into Season 6, and "Timescape" is the 17th good episode. The quality ratio rises once again to 68 per cent.